In statements made yesterday, Donald Trump admitted what the anti-choice movement has tried to hide all along — instead of providing women with safe, supported access to reproductive health care, they want to ban all abortion and treat women who have abortions like criminals. This is not the first time anti-choice politicians have been called out for advancing laws and views that treat women who have abortions and the doctors who provide them like criminals. In 2008, the National Institute for Reproductive Health’s Winning Message Action Fund ran ads in battleground states asking the question, if abortion is made illegal and a woman is criminalized for having one, how much time should she do? Since then, anti-abortion laws have proliferated, making it more difficult, in some cases impossible, for a woman to access abortion. Since 2010, anti-choice politicians have quietly passed 334 laws that shame, pressure, punish — even criminalize — women who have decided to have an abortion. Just this month in Oklahoma, a ballot initiative petition was filed that makes providing abortion a homicide, punishable by jail time, and women have been arrested in states like Tennessee, where a woman was prosecuted this past December for attempting to self-induce abortion. 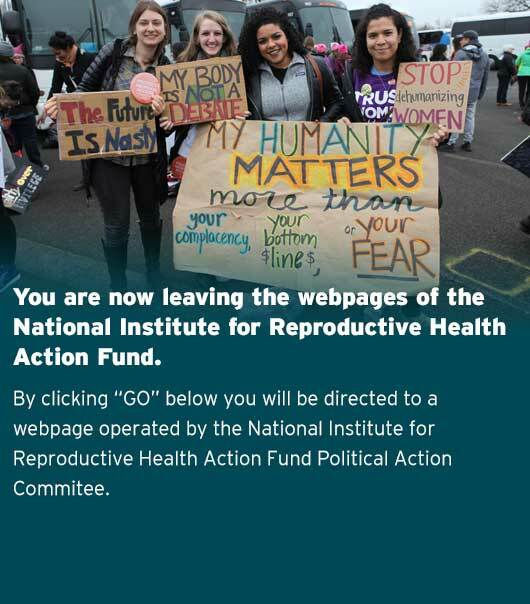 The National Institute for Reproductive Health Action Fund, a 501(c)(4) organization, conducts legislative and political advocacy to protect and advance reproductive health, rights, and justice and supports partner advocacy in states and cities nationwide.